Inferior Parietal Lobes, Apraxia, Agraphia, Alexia, Language (reprinted and updated from Neuroscience, Academic Press, 2000. 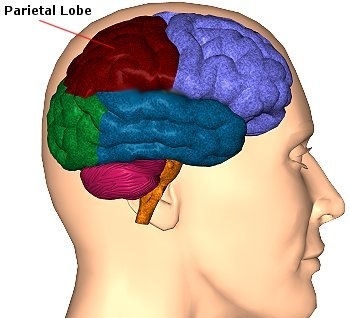 The parietal lobes are the senior executive of the physical-body-in-space and maintains one's personal image of the body, both physical and visual. 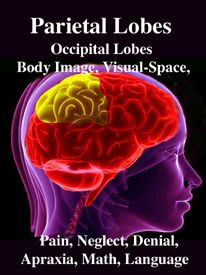 The parietal lobes receives distinct sensory impressions from the entire body and can feel "pain" or a bug crawling on one's arm, leg, or face. It is the parietal lobe which guides the movement of the body in space, coordinating body movement while running, walking, skipping, or climbing over obstacles. 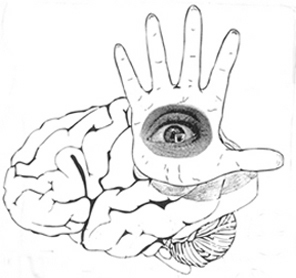 The parietal lobe are also considered a "lobe of the hand" and receives sensory sensations from the bones, tendons, muscles, and skin of the hand, and guides the movement of the hand in visual-space. Therefore, the ability to reach for and manipulate a tool, open and remove the cap from a bottle and pour the contents into a glass, are made possible by the parietal lobe in association with the frontal motor areas and the visual cortex. 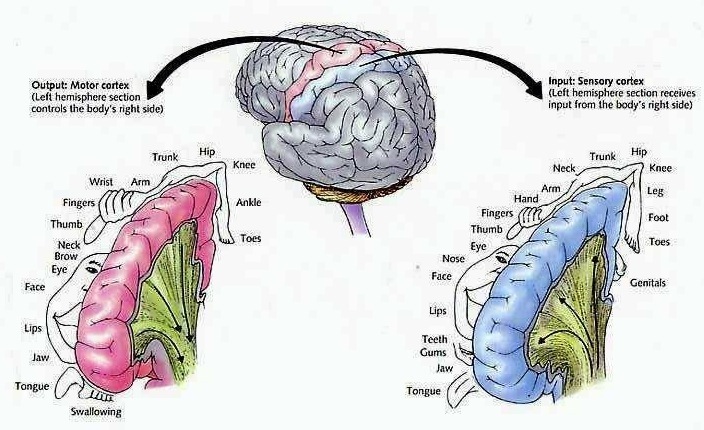 The parietal lobes are not a homologous tissue but consists of cells which are responsive to a variety of divergent stimuli, including movement, hand position, objects within grasping distance, audition, eye movement, pain, heat, cold, as well as complex and motivationally significant visual stimuli (Aoki et al., 2008; Cohen et al. 2014; Deibert et al., 2008; Dong et al. 2014; Lam, et al., 2008; Lebedev et al. 2014; Lin & Sessle 2014; Pred'Homme & Kalaska 2014; Remy et al., 2008; Snyder et al., 1998). Developmentally, of all cortical regions, the inferior parietal lobule is one of the last to functionally and anatomically mature (Blinkov & Glezer, 1968; Flechsig, 1901; Conel, 1937-1943; Joseph & Gallagher, 2005, Joseph et al., 2004). Hence, many capacities mediated by this area (e.g. reading, calculation, the performance of reversible operations in space) are late to develop appearing between the ages of 5-8. 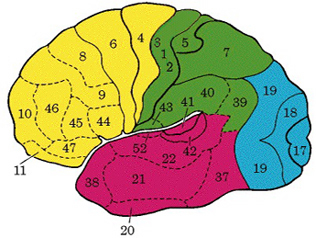 Sitting at the junction of the temporal, parietal, and occipital lobes, the inferior region (which includes the angular and supramarginal gyri) has no strict anatomical boundaries, is partly coextensive with the posterior-superior temporal gyrus, and includes part of area 7 as well as area 37. 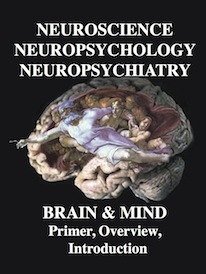 It maintains rich interconnections with the visual, auditory, and somesthetic associations areas including the middle (basal) temporal lobe, the superior colliculus via the pulvinar, the lateral geniculate nucleus of the thalamus, and massive interconnections with the frontal lobes, inferior temporal region, and other higher order assimilation areas throughout the neocortex (Bruce, Desimone & Gross, 2006;Burton & Jones, 1976; Geschwind, 1965; Jones & Powell, 1970; Seltzer & Pandya, 1978; Zeki, 1974). 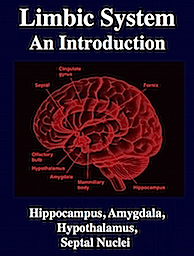 As noted in chapters 5 and 12, over the course of evolution the amygdala, hippocampus, and medial temporal lobe began to balloon outward and upward, giving rise to superior temporal lobe, and then continuing to expand in a posterior direction, forming part of the angular and marginal gyrus. Hence, this portion of the inferior parietal lobule has auditory and thus (in the left hemisphere) language capabilities. However, with the evolution of the thumb and the capability of utilizing a precision grasp coupled with tool making and related temporal-sequential tasks, the superior parietal lobule also expanded, thereby also giving rise to inferior parietal neocortical tissue. Given its location at the border regions of the somesthetic, auditory, and visual neocortices, and containing neurons and receiving input from these modalities, as the inferior parietal lobule evolved it became increasingly multimodally responsive; a single neuron simultaneously receiving highly processed somesthetic, visual, auditory and movement related input from the various association areas. Hence, many of the neurons in this area are multi-specialized for simultaneously analyzing auditory, somesthetic, and spatial-visual associations, and have visual receptive properties which encompass almost the entire visual field, with some cells responding to visual stimuli of almost any size, shape, or form (Bruce et al. 1982, 2006; Hyvaerinene & Shelepin, 1979). Inferior parietal neurons are involved in the assimilation and creation of cross modal associations and act to increase the capacity for the organization, labeling and multiple categorization of sensory-motor and conceptual events (Geschwind, 1965; Joseph 1982). One can thus create visual, somesthetic, or auditory equalivalents of objects, actions, feelings, and ideas, simultaneously. For example, conceptualizing a "chair" as a word, visual object, or in regard to sensation, usage, and even price. That is, the IPL is directly involved in naming--as demonstrated by functional imaging (Price, 2011). The left IPL becomes activated when reading ( Bookheimer, et al., 2013; Menard, et al., 2012; Price, 2011 Price, et al., 2012; Vandenberghe, et al., 2012) during semantic processing (Price, 2011), and when generating words (Shaywitz, et al., 2013; Warburton, et al., 2012) or when making syllable judgements (Price, 2011). Indeed, the IPL appears to act as a pholological storehouse that becomes activated during short-term memory and word retrieval (Demonet, et al., 2014; Paulesu, et al., 2014; Price, 2011) and becomes highly active when retrieving the meaning of words during semantic processing and semnatic decision tasks (Price, 2011). Because of it's involvement in functions such as those described above, one side-effect of damage to the left angular gyrus, is a condition called anomia, i.e. severe word finding and confrontive naming difficulty. These individuals have difficulty naming objects, describing, pictures, etc. Moroever, lesions involving the angular gyrus, or when damage occurs between the fiber pathways linking the left inferior parietal lobule with the visual cortex, there can also result Pure Word Blindness. This is due to an inability to receive visual input from the left and right visual cortex and to transmit this information to Wernicke's area so that auditory equivalents may be called up. Such patients are thus unable to read and suffer from alexia. Because the inferior parietal lobule also acts as a relay center where information from Wernickes region can be transmitted, via the arcuate fasciculus, to Broca's area (for expression) destructive lesions, particularly to the supramarginal gyrus of the left cerebral hemisphere can result in conduction aphasia (see chapter 11). Although comprehension would be intact and a patient would know what she wanted to say, she would be unable to say it. Nor would she be able to repeat simple statements, read out loud, or write to dictation. This is because Broca's area is disconnected from the posterior language zones. 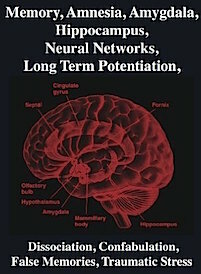 The IPL (which includes the angular and supramarginal gyrus) assimilates associations received from yet other areas of the left and right hemisphere (including the amygdala and cingulate gyrus), fills any gaps with relevant associations, and then injects the resulting verbal associations into the stream of language and thought via the arcuate and longitudinal fasciculus which interlinks the language areas. Hence, the concept of a "language axis" (Joseph, 1982, 2009e,f). This parallel and localizationist convergence model of language is based on lesion studies and human brain dissection, has been confirmed by functional imaging studies, and has recently been adapted by other theorists (reviewed in Joseph, 2009f). For example, as based on functional imaging studies, it has been demonstrated that speech processing, reading, subvocal vocalization, and innerspeech activates the left frontal lobe (Buchel et al., 2008; Demonet, et al., 1994; Paulesu, et al., 2013; Peterson et al., 1988). And, left frontal activation increases as word length increases, and in response to unfamiliar words (Price, 2007). In addition, reading and speaking activates the Wernicke's area and the left posterior temporal lobe (Bookheimer, et al., 2005; Howard et al., 1996), including the supramarginal gyrus (Bookheimer, et al., 2005), angular gyrus of (Price, 2007) and (when reading) the left medial extrastriate visual cortex (Peterson et al., 1990). Moreover, when making semantic decisions (involving reading words with similar meanings), there is increased activity in the left posterior temporal lobe at the junction of the IPL (Price, 2007). Moreover, like the left frontal lobes, the left temporal areas are activated during word generation (Shaywitz, et al., 2005; Warburton, et al., 1996), and sentence comprehension tasks (Bottini, et al., 1994; Fletcher et al., 2005), whereas the IPL in general appears to serve as a phonological storehouse that becomes activated while reading, listening, and when engaged in a variety of languages tasks including word retrieval (Bookheimer, et al., 2005; Demonet, et al., 1994; Menard, et al., 1996; Paulesu, et al., 2013; Price, 2007; Vandenberghe, et al., 1996). Moreover, activation in the IPL as well as the left frontal and left temporal lobe increases as word length increases and for long and umfamiliar words (Price, 2007). The reason apes do not understand grammar or use spoken language is because they are almost completely lacking a recent neurological evolutionary acquisition, the angular gyrus of the IPL. It is the inferior parietal lobule which makes not only fully formed ASL possible, but the evolution of grammatically correct language, be it spoken, or gestural in the form of drawing, painting, or writing. 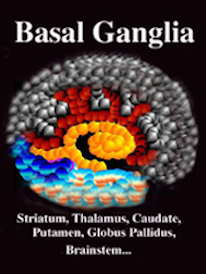 However, the inferior parietal lobule (the angular and supramarginal gyrus) is not just a "hand" area but a multi-modal language area which acts to sequence language as well as inject words and categories into the stream of language and thought (Joseph, 1982). The role of the IPL in language is not only evident as based on lesion studies (as will be discussed) but functional imaging. For example, as based on functional imaging, it appears that the supramarginal gyrus may act as a phonological storehouse that becomes activated during short-term memory and word retrieval (Demonet, et al., 1994; Paulesu, et al., 2013; Price, 2007); whereas conversely, deficits in phonological processing are the most common correlate of reading disability (Brady & Shankweiler, 2001). Simply looking at words will activate the left supramarginal gyrus (Bookheimer, et al., 2005; Vandenberghe, et al., 1996; Menard, et al., 1996; Price, 2007) which also becomes active when performing syllable judgements (Price, 2007), and when reading (Bookheimer, et al., 2005; Menard, et al., 1996; Price, et al., 1996). Likewise, the IPL become highly active when retrieving the meaning of words during semantic processing and semantic decision tasks and activation increases as word length increases (Price, 2007). As detailed below and in chapters 6, with the evolution of the IPL, what had been limbic language became yoked to the neocortex. 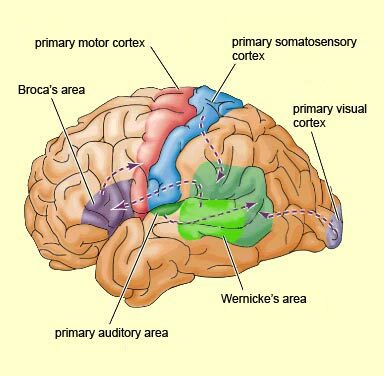 Briefly, the lateral frontal convexity, including Broca's area, may have evolved from the supplementary motor areas and medial frontal lobe which in turn evolved from and is richly interconnected with the anterior cingulate (e.g. Sanides 1964). 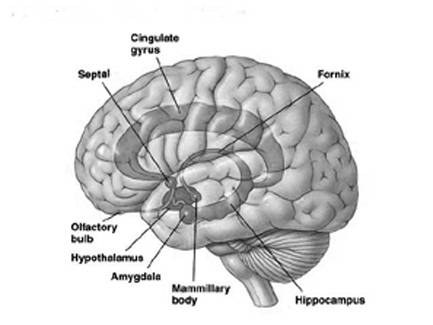 The amygdala (and hippocampus) gave rise to the medial and inferior temporal lobes, the insula (see Sanides 1964), followed by the superior temporal lobe, Wernickes area, and by extention, portions of the inferior parietal lobule. The IPL, however, is also an evolutionary derivative of superior parietal tissue which expanded in accordance with and as represented by temporal sequential hand use and fine motor function involving the fingers and the thumb. The evolution of the IPL (that is, the angular gyrus), therefore, may have served as a nexus, interlocking, at a neocortical level, the cingulate-Broca pathways, and the amygdala-Wernicke's pathway, thereby enabling limbic language impulses to become hierarchically represented as well as subject to temporal sequencing by neocortical neurons (Joseph 2013, 2009e,f). 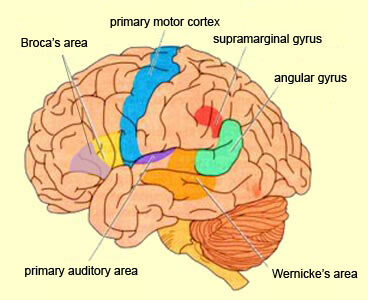 Prior to the evolution of the IPL/angular gyrus, Broca's area presumably was unable to receive sufficient input from primary auditory receiving and Wernicke's areas (and the amygdala), and language thus remained by and large, limbic and controlled by the anterior cingulate gyrus. 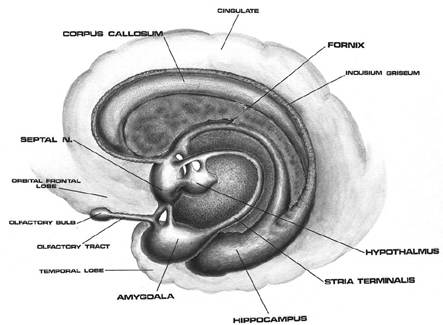 The impetus for inferior parietal and frontal lobe and Broca's area evolutionary development, however, appears to be two-fold, being in part limbic derivatives (amygdala-hippocampus, amygdala-cingulate) and a function of the evolution of fine motor control involving the facial-oral musculature, vocalization, and especially the establishment of handedness. Given that the human left corticospinal tract matures earlier and crosses the medullary pyramids at an earlier age than fibers from the right (Kertesz & Geschwind 1971; Yakovlev & Rakic 1966), thereby presumably establishing synaptic control over the spinal and cranial motor nuclei in advance of the right as well, dominance for hand control and temporal sequential processing became the province of the left hemisphere (Joseph 1982). With motor dominance, the left amygdala, cingulate gyrus, superior temporal lobe, inferior parietal and frontal were reorganized accordingly. 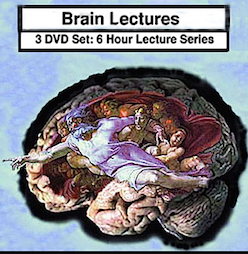 As noted, a large area of parietal lobe neocortex is devoted to hand and finger representation and the guidance of the hand and arm during reaching, throwing, temporal sequential and related movements (chapter 20). Indeed, motor functioning is dependent on sensory feedback which in turn is provided by the parietal lobe (chapter 20). That is, if not for the sensory feedback provided by the muscles and joints (information which is transmitted to the parietal lobes) movement would become clumsy and uncoordinated since a person would not know where their limbs were in space and in relation to one another. 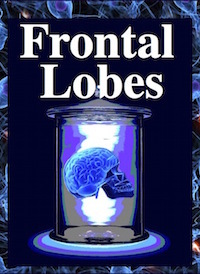 Since the parietal lobes and the motor areas in the frontal lobes are richly interconnected, they serve in many ways as a single neurocortical unit, i.e. 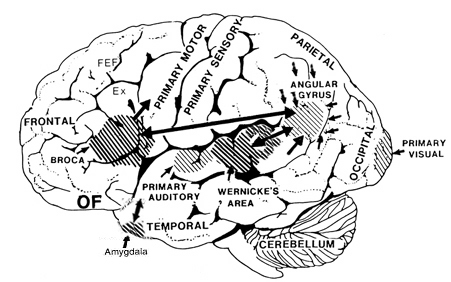 sensorimotor cortex (Luria, 1980). It is in part due to the interrelationship between sensory feedback, motor control and gesture, that hand control and gesture are greatly dependent on the parietal area, the left IPL in particular. In addition, the motor engrams that make possible temporal and sequential motor acts (e.g. making a cup of coffee, fashioning a tool) appear to be localized within the inferior parietal lobe (Heilman et al. 1982; Kimura, 2013; Strub & Geschwind, 2005). It is the IPL which enables humans to engage in complex activities involving a series of related steps, create and utilize tools, produce and comprehend complex gestures, such as American Sign Language (ASL), and express and perceive grammatical relationships (Joseph, 2013, Kimura, 2013; see also Corina et al. 1992). Hence, when the left IPL has been injured patients may be afflicted with apraxia (Heilman et al. 1982) and have difficulty with tasks requiring complex motor sequencing. 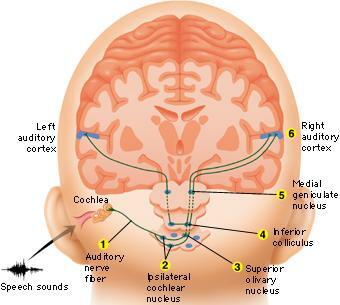 Broca and Wernicke's areas and thus left cerebral linguistic functioning are exceedingly dependent on the IPL and it's capacity to impose rhythmic temporal sequences on auditory associations and motoric actions (Geschwind, 1966; Goodglass & Kaplan, 1982; Joseph, 2013, 2009e; Heilman et al. 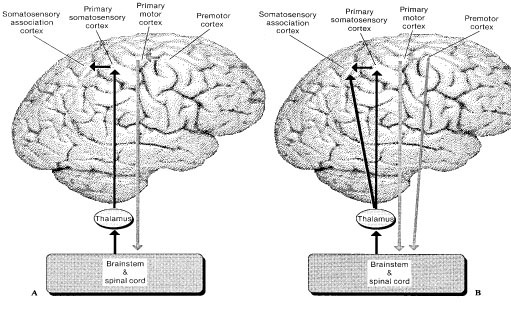 1982; Kimura, 2013; Strub & Geschwind, 2005), including vocalizations which arise from the limbic system. Presumably when the inferior parietal lobule and the angular gyrus fully evolved, humans acquired the capacity to segment incoming sounds and to hierarchically represent and punctuate social-emotional, limbic vocalizations so as to vocally express themselves in temporal and grammatical sequences. Thus social-emotional vocalizations came to be governed by grammatical rules of organization, thus producing "modern" human language. In humans, the left IPL being an indirect product of temporal lobe and superior parietal evolution (see chapter 6) is capable of multimodal processing of auditory, visual, as well as tactile impressions, and then naming this material by forming verbal associations. The IPL then injects this material into the stream of language and thought. 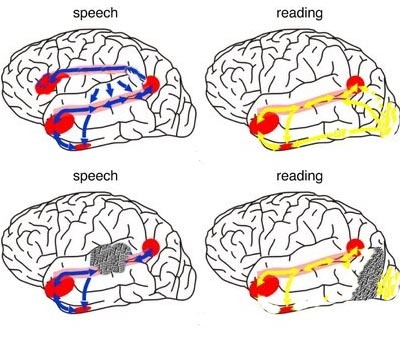 For example, as based on functional imaging, the left IPL becomes highly active when looking at words and reading, and when engaged in word retrieval (Bookheimer, et al., 2005; Vandenberghe, et al., 1996; Menard, et al., 1996; Price, 2007). Indeed, because of its unique position at the juncture of the auditory, visual, somesthetic, and motor neocortex, it has gained the capability of analyzing, associating, and assimilating this divergent data in order to create multiple categories of visual, auditory, and tactile imagery and meaning. Hence, because the IPL receives multi-modal input, one can feel an object while blindfolded and know what it would look like and be able to name it as well. One can also integrate and assimilate these diverse sensory signals so as to abstract, classify and produce multiple overlapping categories of experience and cross modal associations (Geschwind, 1966; Joseph, 1982, 1986a 2013; Joseph et al., 1984). 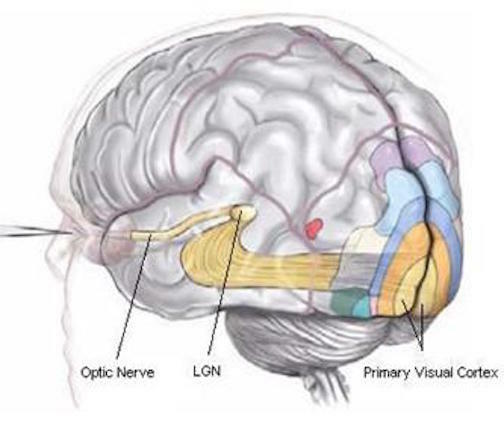 The primary sensory receiving areas for vision, audition, and somesthesis are located in the occipital, temporal and parietal lobe respectively. Adjacent to each primary zone is a secondary-association neocortical region where higher level information processing occurs and where complex associations are formed. 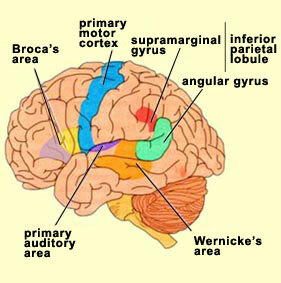 Wernicke's region is one such zone, as is the middle-inferior (basal) temporal and the superior parietal lobe. 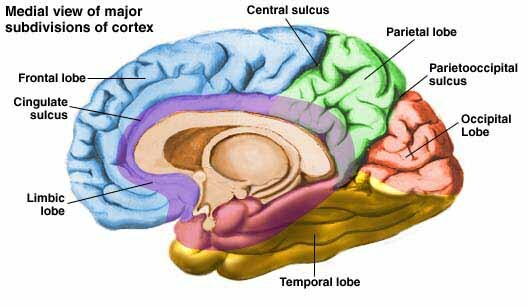 Moreover, there are complex third order association areas such as the middle-inferior temporal lobe (Brodmann's area 37). 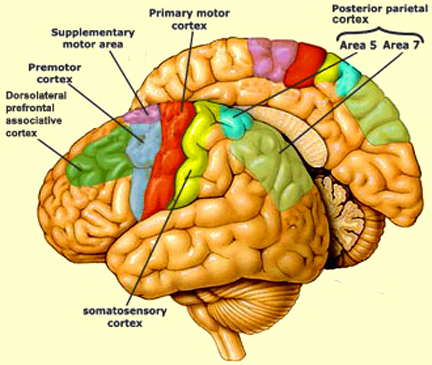 Area 37 is located between the visual cortex and the anterior temporal cortex and becomes activated during a variety of language tasks, including reading and object and letter naming (Price, 2007)-- as demonstrated by functional imaging (Buchel et al., 2008; Price, 2007), direct cortical recoding (Nobre et al., 1994), and electrical stimulation (Luders et al., 1986). In fact, both normal, cognitally blind, and late-blind subject display activity in the medial temporal area (Buchel et al., 2008). Moreover, similar to injuries in the IPL, if the middle-inferior temporal lobe is injured, patients may suffer from reading and naming deficits (Rapcsak, et al., 1987); a condition referred to as phonological alexia. As noted, deficits in phonological processing are the most common correlate of reading disability (Brady & Shankweiler, 2001). The IPL (which includes the angular and supramarginal gyri) is located at the junction where the all secondary and multi-modal association areas meet and overlap, and receives converging visual-linguistic input from the basal-lateral (middle-inferior) temporal lobe. 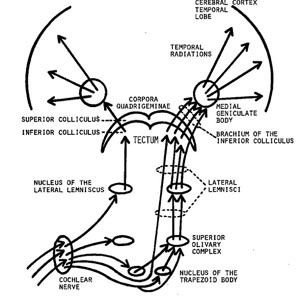 In this regard, the inferior parietal region receives converging higher order information from each sensory modality and all association areas and in fact makes possible the formation of multiple associations based on the assimilation of this divergent sensory input (Geschwind, 1965, Joseph, 1982, 2013). One can thus feel an object while blindfolded and know what it would look like and be able to name it as well. Through its involvement in the construction of cross-modal associations, this region acts so as to increase the capacity for abstraction, categorization, differentiation, and the verbal as well as visual labeling of sensory-motor experience. One is thus able to classify a single stimulus or event in multiple ways. 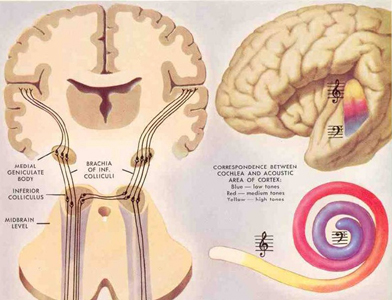 In part this is made possible because the inferior parietal lobule is the recipient of the simple and complex associations already performed in the primary and association cortices via the ten billion axonal interconnections that occur in this region. The left IPL of which it is part, makes possible the assimilation of complex associations which have been constructed elsewhere so that multiple classifications, categorizations, and descriptions are possible. The IPL also acts to integrate and arrange them according to preestablished (gestural) temporal sequences and the requirements of what needs to be communicated. Moreover, via rich interconnections with Wernicke's area and the middle temporal lobe, the IPL it is able to associate auditory/verbal labels with other sensory experiences such that we can describe things as "sticky, sweet, moist, red, lumpy," as well as use single word descriptions, e.g. "jelly." This capability is particularly important in regard to reading and naming as described in further detail in chapters 20, 21. 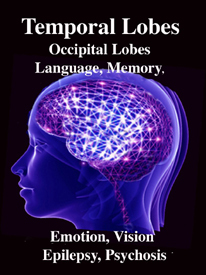 For instance, when a word is read, the pattern of visual input is transmitted from the visual areas in the occipital and temporal lobes to the left IPL (which is coextensive with Wernicke's area) and which then performs an auditory visual matching function. That is, it calls for and integrates the auditory equivalent of what is viewed or read so that we can name animals, objects, words and letters and know what the name sounds like. If this area were damaged, reading ability would be lost, a function in part, of disconnection between the IPL and the middle-inferior temporal lobe. As noted, the left IPL (including the left posterior-superior temporal lobe become more active when reading (Bookheimer, et al., 2005; Menard, et al., 1996; Price, 2007 Price, et al., 1996; Vandenberghe, et al., 1996) and becomes active during semantic processing (Price, 2007), and when making semantic decisions, such as when reading words with similar meanings (Price, 2007). These same areas are activated during word generation (Shaywitz, et al., 2005; Warburton, et al., 1996), and sentence comprehension tasks (Bottini, et al., 1994; Fletcher et al., 2005). In most instances in which the IPL is activated via internal or external sources of stimulation, multiple trains of inquiry are initiated via the numerous interconnections this areas maintains. Impressions, memories, ideas, and feelings which are in any manner associated with the initial stimulus probe, are aroused in response. If a student is asked: "What did you do in school today?" a number of verbal and memory associations and association areas are aroused in parallel and integrated within the Language Axis, all of which are related in some manner to each element of the eliciting stimulus. Finally, in the process of associational linkage, those associations with the strongest stimulus value and which most closely match each element of the question in terms of internal and external appropriateness and thus with the highest probability of being the most relevant, rapidly take a place in a hierarchical and sequential, grammatical arrangement that is being organized in a form suitable for expressing a reply. To return to the question regarding "school," each speech segment and sound unit become triggers which first activate and then, like a magnet, draws associations accordingly. All aroused forms of mental imagery, verbal associations and so on which are received in the IPL are then arranged, individually matched and group matched such that the associations which correspond to all sources of relevant input with sufficient value of probability then act as templates of excitation that stimulate and attract other relevant ideas and associations. These in turn are assimilated and associated or are subsequently deactivated due to their low probability in contrast to the association already organized. Moreover, because the strength and value of closely linked associations change in correspondence to the developing sequential hierarchy (or the initial parallel hierarchies), previously aroused and assimilated material may subsequently come to have a now lower value of probability or appropriateness within the the matrix of overall activity and may be deactivated (Joseph, 1982, 1986a, 2013). Consider the question: "What is furry, small, loves milk and makes the sound Meoww?" At the level of the neocortex, each word, "furry," "small," "milk" and "meoww," acts to trigger associations (e.g. "furry = coat-animal-...," "milk = liquid-white-cow-..."). The grammatical linkage of these words also acts to trigger certain associations (e.g. "furry-milk-meoww = animal-cat-...") while deactivating others (e.g. "cow"). Following the analysis and comprehension of these sounds and words in Wernicke's area, the angular gyrus, and the middle temporal lobe, the IPL continues to call forth associations so that a reply to the question can be generated. So that the animal can be named, the IPL via its interactions with the temporal lobe, activates the necessary phonemic elements (e.g. "k-a-t"), and then transfers this information to Broca's area and the question is answered: "Cat." If instead the individuals replies "tak" this would indicate a problem in organizing the correct phonemic elements once they were activated (see chapter 21 for an extended and detailed discussion). The final product of this hierarchical, highly grammatical arrangement of mutually determining and parallel associational linkages is the train of thought or a temporal-sequential stream of auditory associations in the form of words and sentences. However, before this occurs, these verbal associations must receive a final temporal-sequential grammatical stamp which is a consequence of the organization imposed on this material as it passes from Broca's area to the oral-speech musculature. Assimilation of input from diverse sources is a major feature of the Language Axis in general. However, if due to an injury the language axis is functionally intact but isolated from a particular source of information about which the patient is questioned, he or she may then suffer word finding difficulty, anomia, or agnosia (Davidoff & De Bleser, 1994; Geschwind, 1965; Shelton et al. 1994). Following massive lesions of a brain area with which it normally communicates, the language axis sometimes begins to invent an answer or reply to questions based on the information available despite the gaps in that data or the incongruent nature of what is being reported. Consider, for example, denial of blindness (following massive injuries to the visual neocortex) or denial or neglect of the left extremity which may also be paralyzed (due to massive right cerebral injuries involving the motor and parietal neocortex). Patients will claim to have sight although they bump into objects or fall, or they may claim that their paralyzed left arm belongs to the doctor or a person in the next room (chapter 10). To be informed about the left leg or left arm, the Language Axis must be able to communicate with the neocortical area which is responsible for perceiving and analyzing information about the extremities. 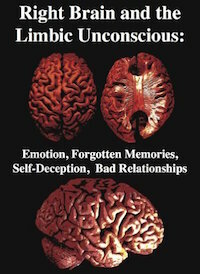 For example, since the right parietal area maintains the somesthetic body-image, as well the storage site for body-image memories, when that areas is destroyed, the left half of the "body-image" all associated memories and essentially "erased" -as if they never existed. When no message is received by the Language Axis, due to destruction of the neocortical area responsible for that message or memory, and when the Language Axis is not informed that no messages are being received (because the brain area which would alert them is no longer functioning), the language zones instead rely on some other source even when that source provides erroneous input (Joseph 1982, 1986a). Substitute material is assimilated and expressed and corrections cannot be made (due to loss of input from the relevant knowledge source) and the patient begins to confabulate (see chapters 10, 19). That is, the Language Axis fills the "gap" with erroneous material. 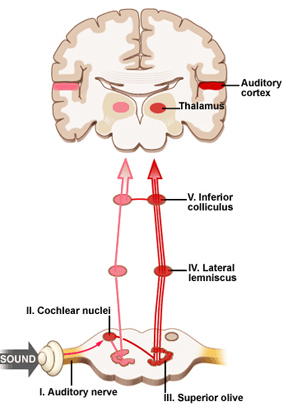 When listening to someone speak the information is transferred from the brainstem to the inferior colliculus and medial geniculate of the thalamus, and transferred to the amygdala and the primary auditory cortex where the data is extensively analyzed (see chapter 21). 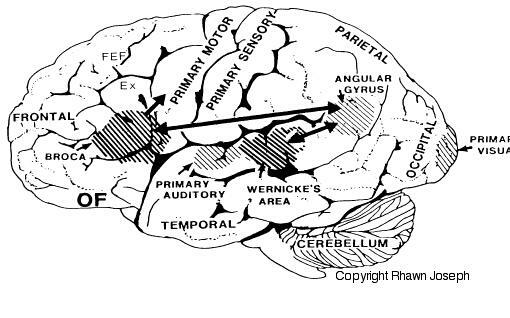 These auditory signals are then transferred to Wernicke's area (which merges with the angular gyrus) where the temporal-sequential, semantic and related linguistic features are stabilized, extracted, analyzed and labled. If it is a question which has been asked, the message is transferred from Wernicke's to the inferior parietal lobule where various ideational associations are aroused and organized via it's vast interconnections with other cortical regions. 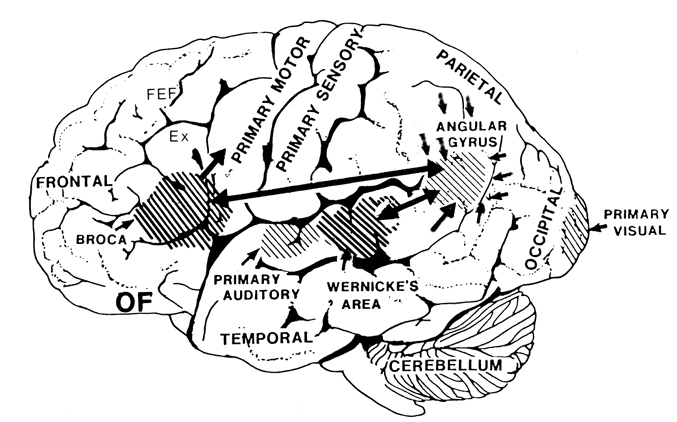 Presumably a series of interactions continue to occur between Wernicke's and the inferior parietal lobe (as these areas are coextensive) until a reply is formulated and properly organized for possible expression at which point it is transferred to Broca's area (Geschwind, 1965; Joseph, 1982)--as also demonstrated through functional imaging (Buchel et al., 2008; Demonet, et al., 1994; Paulesu, et al., 2013; Peterson et al., 1988; Price, 2007). 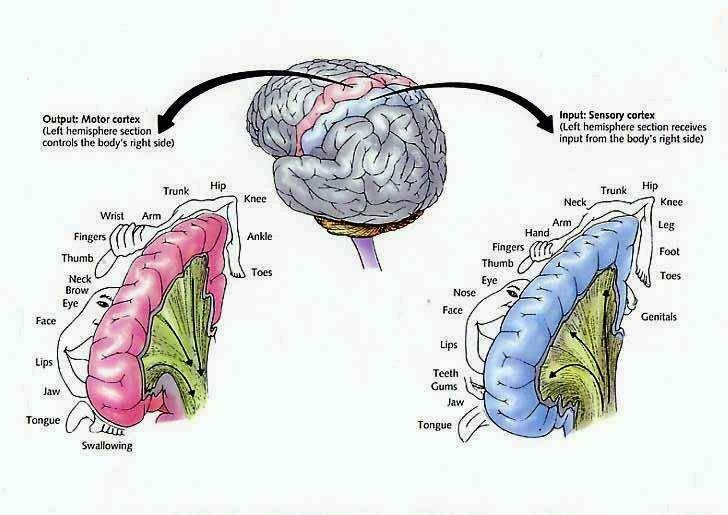 Specifically, the semantically correct and suitably chosen reply is transferred from Wernicke's region and the inferior parietal lobe, via the interlining axonal bundle, the arcuate fasciculus, to Broca's area which then programs the speech musculature and neocortical motor areas so that the reply can expressed. It has been argued that the sensory motor engrams necessary for the production and perception of written language are stored within the parietal lobule of the left hemisphere (Strub & Geschwind, 1983). In fact, given that the parietal lobes are concerned with the hands and lower visual fields, they not only guide and observe hand movements, but learn and memorize these actions, including those involved in writing. Hence, when lesioned, patients sometimes have difficulty writing and forming letters due to an inability to access these engrams (Strub & Geschwind, 1983; Vignolo, 1983); i.e. they suffer from agraphia, an inability to write (see chapter 11). Writing samples may be characterized by misspellings, letter omissions, distortions, temporal-sequential misplacements, and inversions (Kinsbourn & Warrington, 1964). Sometimes agraphia is accompanied by alexia; inability to read (Benson & Geschwind, 1969; Hecaen & Kremin, 1977). Because it is a recipient of so much information and aids the rest of the brain in various forms of analysis, one function of the inferior parietal lobe is to maintain track of input/output so that information may be organized appropriately in either a sequential (i.e. first, middle, last), or spatial framework. Hence, another side effect of lesions localized to the inferior parietal lobule is a disruption of visual-spatial functioning, temporal-sequencing ability (e.g. apraxia), as well as logic, grammar, and the capacity to perform calculations; depending on which hemisphere is compromised. Individuals with lesions involving the inferior-parietal-occipital border of either hemisphere may have difficulty carrying out spatial-sequential tasks. For example, drawing "a square beneath a circle and a triangle beneath a square" (Luria, 1980). Often they may draw the objects in the order described (i.e. square, circle, triangle, square). That is, they have difficulty in conceptualizing how to place the objects in relation to each other. Those with left inferior parietal lesions have trouble with more obvious sequential-grammatical relationships (Luria, 1980). For example, they may be unable to understand the question: "John is taller than Jim but shorter that Pete. Who is taller?" In part, this is not only a function of left parietal dysfunction but the right hemispheres difficulty in dealing with temporal-sequential and grammatical relations. Because the right brain does not understand grammatical relationships, a sentence that starts which the name "John" is interpreted by the right parietal area as all about "John". i.e. the first word of the sentence is undertood by the right brain as the "agent" regardless of semantics or grammar (Chernigovaskaya & Deglin, 2006). In this manner, if presented with the sentence, "give me the book after you give me the pencil", the right brain would respond to the order of presentation rather than their grammatical relationship and would thus present the book then the pencil. When left parietal input is abolished, proper temporal-sequential and grammatical programming/comprehension thus suffers. The parietal lobe is highly concerned with the mediation of movement. 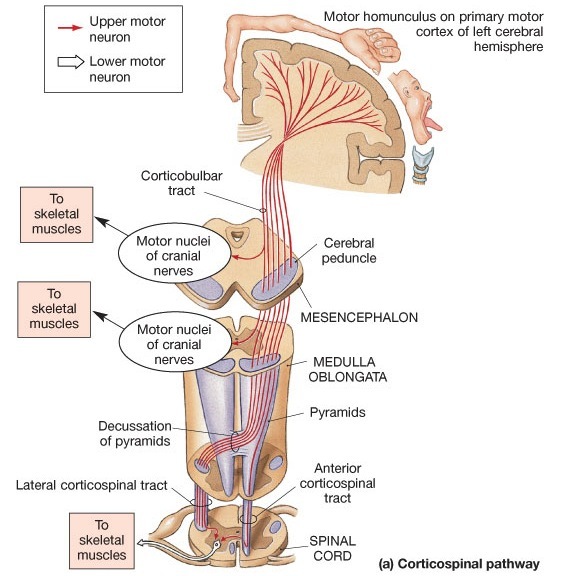 As noted in chapter 19, the primary motor cortex extends well beyond area 4 and includes portions of the somatosensory regions which in turn contribute almost one third of the fibers which make up the pyramidal tract. These areas are in fact richly interconnected (Jones & Powell, 1970). Together, the motor and somesthetic regions comprise a single functional unit, i.e. the sensorimotor cortex. Nevertheless, it is important to emphasize, as pointed out by Luria (1980) that every voluntary movement is in fact comprised of a series of movements which are spatially organized in accordance with successively changing input from other modalities (Barrett, et al., 1998; Buxbaum et al., 1998; Kimura 2014). That is, in order for a movement to be correctly planned and carried out signals must be directed to the right muscle groups as based on efferent streams of visual, somesthetic, as well as auditory input. This includes information regarding the position of the body and limbs in space. Indeed, movement becomes extremely difficulty without sensory feedback and guidance. Because of this, parietal lesions can result in unilateral paresis and even wasting (i.e. parietal wasting). Hence, the somesthetic cortex is very important in the guidance of movement, and in fact some neurons fire prior to making a movement (Lebedev et al. 2014). Although the entire parietal lobule makes important contributions , the superior and inferior parietal lobule of the left hemisphere appears to be the central region of concern in regard to the performance of skilled temporal-sequential motor acts. This is because the motor engrams for performing these acts appear to be stored in the left angular and supramarginal gyri (Geschwind, 1965; Heilman, 2014) -a consequence, in part of its unique ability to guide, visually observe, and thus selectively learn hand movements, gestures, and complex temporal sequential actions such as involving tool construction (Joseph 2014, 2008e). Related memories are therefore stored in this cortex. Conversely, these hand movement related memories assist in the programing of the motor frontal cortex where the actions are actually executed (e.g. Deibert et al., 2008). However, the inferior parietal lobule in turn is dependent on input from the primary and association somesthetic areas. There is some evidence of laterality in regard to all of the above, the right half of the brain may be more concerned with movement of the trunk and the lower extremities. This would include navigational movement through space, running, certain types of dancing, and actions requiring analysis of depth and balance. The left cerebral hemisphere exerts specialized influences on the upper extremities including the control of certain types of complex, sequenced motor acts such as those requiring alterations in the orientation and position of the upper limbs (Haaland & Harrington 2014; Kimura, 1982, 2014). If the left inferior parietal region is destroyed the patient loses the ability to perform actions in an appropriate temporal-sequence or to even appreciate when they have been performed incorrectly. They may also be impaired in their ability to acquire or perform tasks involving sequential changes in the hand or upper musculature (Kimura, 1979, 1982, 2014), including well learned, skilled, and even stereotyped motor tasks such as lighting a cigarette or using a key. Apraxia is a disorder of skilled movement in the absence of impaired motor functioning or paralysis (Barrett et al., 2008; Buxbaum et al., 2008). Usually apraxic patients show the correct intent but perform the movements in a clumsy fashion. Like many other types of disturbances, patients and their families may not notice or complain of apraxic abnormalities. This is particularly true if they're aphasic or paralyzed on the right side. That is, clumsiness with either extremity may not seem significant. Hence, this is something that requires direct evaluation. Performance deteriorates the most when required to imitate or pantomime certain actions including the correct usage of some object (McDonald et al. 2014). For example, the patient may be asked to show the examiner, "how you would use a key to open a door", or "hammar a nail into a piece of wood". In many cases the patient may use the body, i.e. a finger, as an object (e.g. a key), rather than the finger and thumb holding the key. Although performance usually improves when they use the real objects (Geschwind, 1965; Goodglass & Kaplan, 1972), a rare few may show the disturbance when using the real object as well (Heilman, 2014; Kimura 2014). In addition, patient's with apraxia may demonstrate difficulty properly sequencing their actions (Barrett et al., 1998). For example, they may pretend to stir a cup of coffee, then pretend to pour the coffee into the cup, and then take a sip. However, the individual acts may be performed accurately. For example, Kimura (1982, 2014) found that the ability to perform meaningless oral or hand movements was related to the frontal or posterior nature of the lesion, such that those with frontal lesions were impaired on oral whereas those with parietal lesions had the most difficulty making hand postures or complex movements of the extremities (Kolb & Milner, 1981). Thus, apraxic abnormalities secondary to left cerebral lesions tend to either involve destruction of the inferior parietal lobule (IFP) or lesions resulting in disconnection of the frontal motor areas (or the right cerebral hemisphere) from this more posterior region of the brain. If the inferior parietal region is destroyed the patient loses the ability to appreciate when they have performed an action incorrectly. If the motor region is destroyed, although the act is still performed inaccurately (due to disconnection from the IFP), the patient is able to recognize the difference (Heilman, 2014; Kimura 2014). Ideomotor apraxia is usually associated with lesions within the inferior parietal lobe of the left hemisphere. Rather than problems with temporal-sequencing of motor acts per se, these individuals tend to be very clumsy when performing an act, and/or they may perseverate and erroneously perform a previous movement. 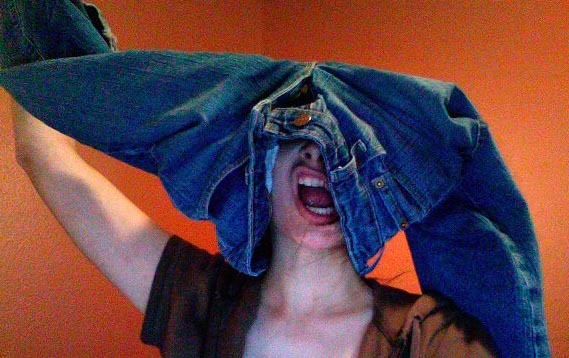 These individuals also tend to be very deficient when attempting to perform an action via pantomime or when engaged in meaningful imitation, meaningless imitation, and the meaningful use or meaningless use of actual objects (Goodlass & Kaplan, 1972; Heilman, 1973; Kimura & Archibald, 1974; McDonald et al. 2014). This is presumably due to destruction of the engrams important in motor performance. Patients will demonstrate apraxic abnormalities in both the right and left hand. In addition, patients with ideomotor apraxia tend to have difficulty with simple versus complex movements, although various elements within a complex action may be performed somewhat abnormal (Hecaen & Albert, 1978; McDonald et al. 2014). Hence, actions such as waving goodbye, throwing a kiss, making the "sign of the cross", may be performed deficiently. Moreover, many patients tend to uncontrollably comment on their actions; i.e. "verbal overflow". That is, when asked to "wave goodbye", they may say "goodbye" while waving even when instructed to say nothing. It has been suggested that ideomotor apraxia can occur in the absence of ideational apraxia, but that the converse is not true (Hecaen & Albert, 1978). In this regard, ideomotor apraxia may be a less severe form of ideational apraxia (Kimura 2014). This form of apraxia is usually due to severe disturbances in the temporal sequencing of motor acts (Buxbaum et al., 1998). That is, the separate chain of links which constitute an entire movement become dissociated, such that the overriding idea of the movement in it's entirety is lost. Hence, these individuals commit a number of temporal and spatial errors when making skilled movements, although the individual elements, in isolation, may be preserved and performed accurately (Hecaen & Albert, 1978; Luria, 1980). For example a patient (via pantomime) may rotate their hand before inserting the key, drink from a cup before filling it from a pitcher of water, or puff from a cigarette and then lighting it. Thus they incorrectly sequence a series of acts. Both hands are effected. Because of conceptual, ideational abnormalities, they may also have difficulty using actual objects correctly. During pantomime they may use a body part as object such as an index finger for a key. Even so, their actions are out of temporal sequence. Hence, these patients seem to be unable to access the motor engrams (or "memories") which would allow them to perform appropriately (Luria, 1980). In this regard, patients are sometimes hesistent to perform a task as they have difficulty understanding what has been asked of them. However, they can often describe verbally what they are unable to perform (Heilman, 2014). Many patients who are aphasic also appear apraxic because they have severe difficulty comprehending language and understanding motor commands. That is, a patient may fail to peform a particular action because he doesn't comprehend what is being asked. 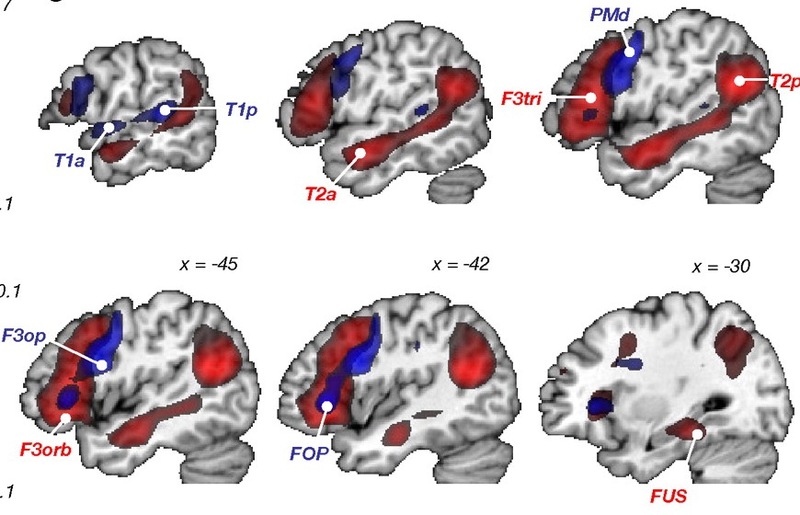 Individuals with damage involving the left parietal lobule not only make errors when performing motor acts but comprehending, recognizing and discriminating between different types of motor acts such as demonstrated via pantomime (Heilman et al. 1982; McDonald et al. 2014). Moreover, individuals with lesions in the left inferior occipital lobe have also been shown to have difficulty verbally understanding, describing or differentiating between pantomimes (Rothi et al. 2006). That is, in the extreme, if one were to pantomime the pouring of water into a glass vs. lighting and smoking a cigarette, these indviduals have problems describing what they have viewed or in choosing which was which. 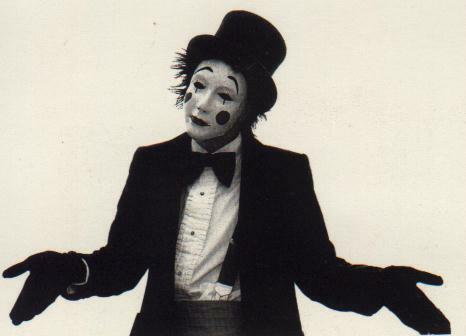 Deficits in pantomime recognition occur frequently among individuals with aphasia (Varney, 1978). Moreover, this disturbance is also significantly correlated with reading comprehension (Gainotti & Lemmo, 1976; Varney, 1978, 1982). In this regard, individuals with alexia frequently suffer from pantomime recognition deficits as well. Because of this relationship it has been suggested that the ability to read may be based on or derived from the abiity to understand gestural communcation, i.e. the reading of signs (Joseph 2014; Varney, 1982). Wang and Goodglass (1992) and Kimura (2014) argue that pantomime imitation and production are related to both apraxia and the ability to interpret purposeful movements; the engrams for which are located in the inferior parietal lobule (Heilman et al. 1982; Joseph 2014; Wang & Goodglass, 1992). By contrast to left anterior lesions which may impair motor functioning and the capacity to imitate the ability to comprehend pantomime is retained (Heilman et al. 1982). As noted, the inferior and superior parietal lobule receives considerable visual input, particularly from the periphery and lower visual field -the area in which the hands are most likely to be viewed. 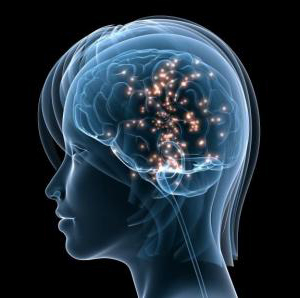 Hence, this area of the brain views, manipulates, guides and mediates hand-object coordination and reaching movements, including the comprehension of hand movements; i.e. gestures (Joseph, 2014). 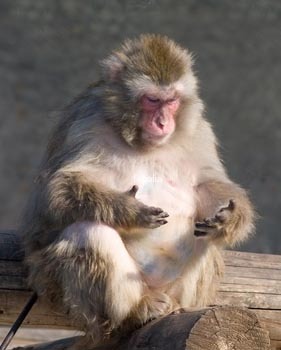 Hence, when the left superior and inferior parietal lobule is destroyed gestural comprehension, including the understanding of (as well as the capacity to execute) complex gestures, including ASL and the capacity to engage in complex temporal sequential acts is significantly impacted. If the right parietal area is destroyed, these deficits may also include constructional apraxia (chapter 10). Moreover, although constructional deficits are more severe after right hemisphere damage (Arrigoni & DeRenzi, 1964; Black & Strub, 1976; Benson & Barton, 1970; Critchley, 1953; Hier et al., 1983; Joseph, 1988a; Kimura 2014; Piercy et al. 1960), disturbances involving constructional and manipulo-spatial functioning can occur with lesions to either half of the brain (Arrigoni & DeRenzi, 1964; Mehta et al., 1987; Piercy et al., 1960). Hence, depending on the laterality, as well as the extent and site of the lesion, the deficit may also take different forms. For example, following posterior right cerebral lesions, rather than apraxic, the patient is spatially-agnosic, i.e. suffering from constructional agnosia and a failure to perceive and recognize visual-spatial and object interrelationships. In other cases, such as following left cerebral injury, the disturbance may be secondary to a loss of control over motor programming (Kimura 2014; Warrington et al., 1966; Warrington, 1969). Although visual motor deficits can result from lesions in either hemisphere (Arrigoni & DeRenzi, 1964; Piercy et al., 1960; Kimura 2014), visual-perceptual disturbances are more likely to result from right hemisphere damage. In contrast, lesions to the left half of the brain may leave the perceptual aspects undisturbed whereas visual motor functioning and selective organization may be compromised (Kim et al. 2004; Mehta et al., 1987; Poeck et al. 1973). As such the patient is likely to recognize that errors have been made. Conversely, constructional disturbances associated with left hemisphere damage are positively correlated with lesion size, and left anterior lesions are worse than left posterior (Benson & Barton, 1970; Black & Bernard, 2004; Black & Strub, 1976; Kimura 2014; Lansdell, 1970). This is because the capacity to control and program the motor system has been compromised. The larger the lesion, the more extensive the deficit. It has been said that the parietal lobule is an organ of the hand. As noted, the hand appears to be more extensively represented than any other body part, parietal neurons are responsive to hand movements and manipulations, mediate and visually observe temporal-sequential hand movements, and become highly activated in response to objects which are within grasping distance. Indeed, given that the parietal lobe receives lower visual field input, the area in which the hands are most likely to be viewed, it is therefore highly sensitive to and concerned with the somesthetic as well as the visual guidance of hand (and lower extremity) movements. 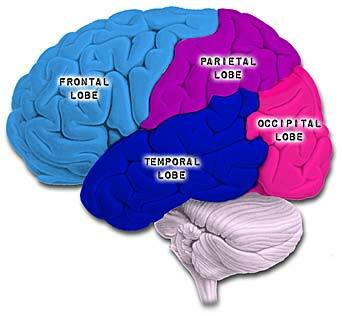 It is also via the hand that the parietal lobe gathers information regarding various objects, i.e. 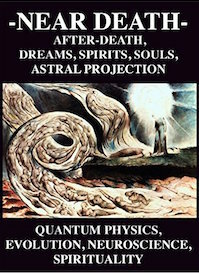 stereognosis, and about the Self and the World, so that things and body parts come to be known, named, and identified. Ontogenetically, the hand is in fact primary in this regard. That is, the infant first uses the hand to grasp various objects so they may be placed in the mouth and orally explored. As the child develops, rather than mouthing, more reliance is placed solely on the hand (as well as the visual system) so that information may be gathered through touch, manipulation and visual inspection. 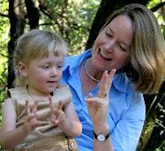 As the child and it's brain matures, instead of predominantly touching, grasping, and holding, the fingers of the hand are used for pointing and then naming -hand activities that are most likely to be viewed (and later remembered) by the parietal lobe. It is these same fingers which are later used for counting and the development of temporal-sequential reasoning; i.e. the child learns to count on his or her fingers, then to count (or name) by pointing at objects in space. 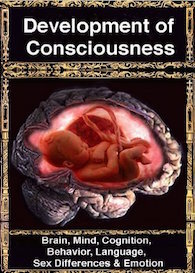 In this regard, counting, naming, object identification, finger utilization, and hand control are ontogenetically linked and seem to rely on the same neural substrates for their expression; i.e. the left inferior and superior parietal lobule. In this regard, the parietal lobe, due to its control over the hand, and its chronic surveillance of the lower visual field, is therefore the unique recipient and observer of specialized hand-related activities and has thus become organized accordingly in regard to the guidance, as well as the learning and memory of hand and finger related activities. Hence, when the more posterior portions of the left hemisphere are damaged, naming (anomia), object and finger identification (agnosia), arithmetical abilities (acalculia), and temporal-sequential control over the hands (apraxia) are frequently compromised. A variety of symptoms are therefore associated with left inferior parietal lobe damage, some of which occur as a related constellation of disturbances, i.e. finger agnosia, acalculia, agraphia, and left-right disorientation: Gerstmann's syndrome (Gerstmann, 1930, 1944; Strub & Geschwind, 1983). 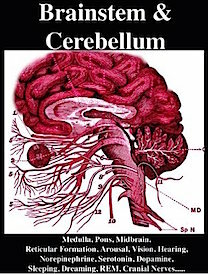 Gerstmann's symptom complex is most often associated with lesions in the area of the supramarginal gyrus and superior parietal lobule (Hrbek, 1977; Strub & Geschwind, 1983). However, because this symptom complex does not always occur together, some authors have argued that Gerstmann's syndrome, per se, does not exist. We will not take issue, pro or con on this controversy but instead will focus on those aspects of Gerstmann's syndrome which have not yet been discussed (finger agnosia, acalculia, left-right disorientation). Finger agnosia is not a form of finger blindness, as the name suggests. 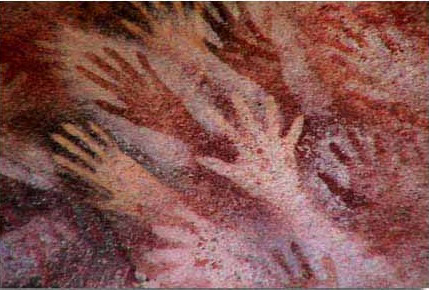 Rather, the difficulty involves naming and differentiating among the fingers of either hand as well as the hands of others (Gerstmann, 1940). This includes pointing to fingers named by the examiner, or moving or indicating a particular finger on one hand when the same finger is stimulated on the opposite hand. For example, if you touch their finger while their eyes are closed, and ask them to touch the same finger they may have difficulty. If the disturbances is subtle the examiner may wish to stimulated two fingers and then ask the patient to indicate, in order, the same fingers. Many patients have difficulty on these tests regardless of there being administered in a verbal (naming) or non-verbal (touching) format (Kinsbourne & Warrington, 1962). In general, it is the middle three fingers which are hardest to recognize and the angosia is demonstrable in both hands. Although finger agnosia is only rarely shown with those who have right hemisphere lesions (Hecaen, 1962) many patients also demonstrate some visual-constructive disability (Kinsbourne & Warrington, 1962). Hence, in testing for this disorder both verbal vs. non-verbal forms are of assistance in determing the side of lesion. Often patients who have difficulty identifying fingers by name or simply differentiating between them non-verbally also suffer from receptive language abnormalities (Sanquet et al., 1971). Nevertheless, this disorder is not merely a manifestation of aphasia because finger angosia may appear in the absence of language abnormalities (Strub & Geschwind, 1983). 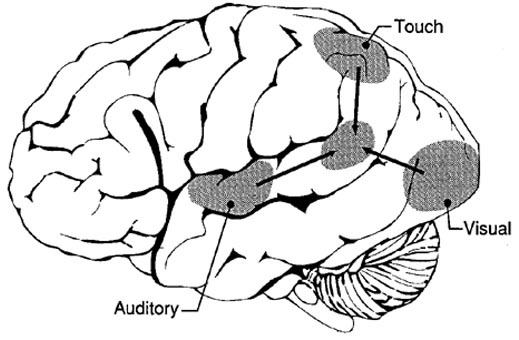 In part, a good way of determining if the disorder is secondary to a right vs. left hemisphere injury is by noting if patients have more problems recognizing fingers on the right vs. left hand, or in transferring from the right to left hand (or vice versa); that is, by stimulating a finger (or fingers) on the right hand (while it is out of sight) and then having the patient indicate the same fingers on the left hand. One must rule out deficient attentional functioning in making this diagnoses. 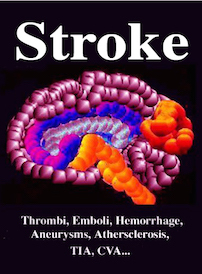 Of course, one should not diagnose brain damage based merely on poor performance of this one index but should look at the overall pattern of deficiency. As noted in chapters 10, 11, there are different aspect of mathematical thinking which in turn depend on different regions of the brain. There are those aspects which are language dependent, and those which are more "intuitive" and which involve the right and left parietal lobe. As based on functional imaging, Dehaene, et al., (1998) determined that an aspect of math they refer to as "exact arithmetic" is language dependent and involves linguistic processing in order to store tables of arithmetical information. Yet another form of math, "approximate arithmetic" is non-verbal, visual-spatial and is more dependent on the right as well as left parietal lobe. 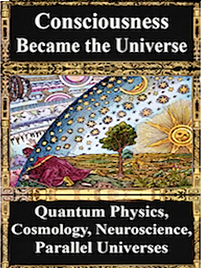 It is thus interesting to note that whereas the IPL is directly implicated in mathematical and geometric thinking, that Einstein's IPL was in fact larger than normal by 15% (Witelson et al., 2008), and that the Sylivan fissure stopped well short of his IPL which in turn may have allowed more neurons in this area to flourish and grow and to establish interconnections. Damage to the IPL, in turn can disrupt the ability to perform math or geometrical problems. Problems working with numbers or performing arithmetical operations, however, can be secondary to a number of causes and may result from injuries involving different regions of the brain. For example, an individual may suffer an alexia/agnosia for numbers, an amnesia for arithmetical facts (Cohen & Dehaene 2014) or they may have difficulties with spatial-perceptual functioning and thus misalign numbers when adding or subtracting (referred to as spatial acalculia). Hence, in many instances a patient may appear to have difficulty performing math problems when in fact the basic ability to calculate per se is intact. That is, the apparent difficulty may in fact be due to spatial, linguistic, agnosic or alexic abnormalities. However, in many instances, patients who are no longer able to perform calculations demonstrate a number of deficiencies. They may erroneously substitute one operation for another, i.e. misreading the sign "+" as "x", such that they multiply rather than add. Or they may reverse numbers i.e. "16" as "61",substitute counting for calculation, i.e. 21 + 6 = 22, or inapprorpiately group: 32 + 5 = 325. On the other hand, with left posterior lesions localized to the vicinity of the inferior parietal lobe, patients may have severe difficulty performing even simple calculations, e.g. carrying, stepwise computation, borrowing (Boller & Grafman, 1983; Hecaen & Albert, 1978). When this occurs in the absence of alexia, aphasia, or visual-spatial abnormalities, and is accompanied by finger agnosia, agraphia, and right-left orientation, it is considered part of Gerstmann's syndrome (Gerstmann, 1930). It has also been referred to as "anarithmetria" (Hecaen & Albert, 1978), or pure acalculia when not accompanied by other abnormalities. Acalculia is an isolated impairment of calculation in the absence of alexia or agraphic or spatial organization problems and involves a disturbance of basic math processes, e.g. carrying, stepwise computation, borrowing (Boller & Grafman, 1983; Levin, 1979). It is manifested as an impairment in the ability to maintain order, to correctly plan in sequence, and to appropriately manipulate numbers, and/or it may be related to an amnesia for arithmetical facts (Cohen & DeHaene 2014). Indeed, one patient, a former accountant, who had suffered a small circumscribed left parietal subdural hematoma in an auto accident, was unable to add past 10 (e.g. 7+4), although able to read, write, speak appropriately, and recognize objects. However, she did demonstrate severe finger agnosia, and in fact the finger agnosia appeared to be directly related to her inability to perform calculations. In this regard, I was able to work with this patient for a number of months and by emphasizing finger recognition tasks, including finger calculations (e.g. taking two fingers on her right hand and four on her left, and saying "two times four is? ), was able to raise her math ability to the high school level. Of course, the normal tendency to partially recover lost functions certainly played a part. Alexia for numbers and digits is found in over 80% of individuals with left temporal-occipital lesions, and in less than 10% of those with right hemisphere lesions. As the name implies, the patient is unable to recognize numbers. Usually these individuals also suffer from generalized or literal alexia (Hecaen, 1962); i.e. an inability to recognize letters. In some cases acalculia may be associated with an alexia and/or an agraphia for numbers, as well as aphasic abnormalities (referred to as aphasic acalculia (Benson & Weir, 1972). Individuals with this disorder are unable to recognize or properly produce numbers in written form. For example, they may be unable to write out or point to the number "4" vs the number "7" or the letter "B". The lesion is usually in the left inferior parietal lobule and localized within the angular gyrus. Not all patients are aphasic however (Levin, 2014). 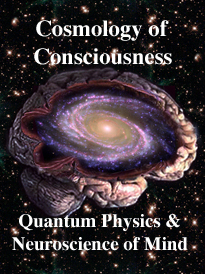 As described in Chapter 10, the right cerebral hemisphere is quite proficient in performing geometrical analysis. However, it's (i.e. the isolated right hemispheres) basic arithmetical abilities are limited to the performance of addition, subtraction and multiplication of simple sums and numbers below 10 (Levy-Agresti, 1968; Sperry, 1968). However, it can also visually recognize correct answers, for small sums, when given a visual choice (Dimond & Beaumont, 1974). Nevertheless, problems with arithmetical reasoning per se, are not usually due to right hemisphere lesions. However, when the right hemisphere is damaged difficulties in calculation may result due to visual-spatial disturbances (Hecaen & Albert, 1978). For example, figures and digits may not be properly aligned, arranged or organized on the page when writing out a problem. Or, the patient may ignore the left half of numbers when adding, subtracting, etc. If given the opportunity to perform the same calculation verbally, frequently little difficulty is demonstrated indicating that the basic ability to calculate is intact. In general, the majority of individuals with spatial acalculia have right hemisphere lesions. However, bilateral disturbances may be present (Boller & Grafman, 1983; Hecaen & Albert, 1978). Right-left disorientation (e.g. "show me your right hand") is usually associated with left hemisphere and left parieto-occipital damage. It occurs only extremely rarely among individuals with right cerebral injuries (Gerstamann, 1930; McFie & Zangwill, 1960; Sauguet et al.1971). In general, these patients have difficulty differentiating between the right and left halves of their body or the bodies of others. This may be demonstrated by asking the patient to touch or point to the side named by the examiner, e.g. "Touch your left cheek", or, "Point to my right ear"; to point on their own body to the body part the examiner has pointed to on his/her body; or in performing crossed commands, "Touch your left ear with your right hand". In mild cases only the crossed comands may be performed deficiently (Strub & Geschwind, 1983). Nevertheless, individuals with aphasic disorders generally perform most poorly of all brain damaged groups (Sauguet et. al., 1971). Interestingly, among presumably neurologically intact adults, approximately 18% of females and 9% of men perform deficiently on right-left orientation tasks (Wolf, 1973). In part, it seems somewhat odd that right-left spatial disorientation is more associated with left rather than right cerebral injuries, given the tremendous involvement the right half of the brain has in spatial synthesis and geometrical analysis. However, orientation to the left or right transcends geometric space as it relies on language. That is, "left" and "right" are designated by words and defined linguistically. In this regard, left and right become subordinated to language usage and organization (Luria, 1980). Hence, left-right confusion is strongly related to problems integrating spatial coordinates within a linguistic framework. 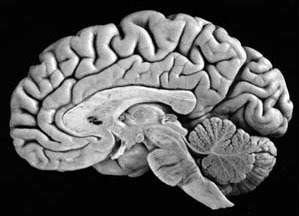 The parietal lobes, although commonly associated with the mediation of somesthetic stimuli, are also concerned with motor and attentional functioning, the perception of spatial relations, including depth, orientation, location, and the identification of motivationally significant auditory, somesthetic, and visual stimuli. It is via the integrative interaction of the parietal lobe that an individual can feel an object and not only determine its physical qualities, (e.g. shape, size, weight, texture), but can visualize, verbally lable, and even write out it's name. It is also via the interaction of these various cell assemblies that an individual can attend to specific objects in space as well as reach out and manipulate them. Indeed, the parietal lobe is very important for mediating movement in visual space. That is, in order for a movement to be correctly planned and carried out signals must be directed to the right muscle groups as based on efferent visual, somesthetic, as well as auditory input. Moreover, one requires sensory information as to the position of the body and limbs in space, otherwise movements will be clumsy. This is accomplished through the dense interconnections linking the primary somesthetic with the motor areas in the frontal lobe and via impulses transmitted down the cortocal-spinal tract. Moreover, parietal neurons appear to guide and monitor movements as they occur in visual space. Although the entire parietal lobule makes important contributions to movement, the inferior parietal lobule of the left hemisphere appears to be the central region of concern in regard to the performance of skilled temporal-sequential motor acts. . These engrams assist in the programing of the motor frontal cortex where the actions are actually executed. If the inferior parietal region is destroyed the patient loses the ability to perform actions in an appropriate temporal-sequence or to even appreciate when they have performed an action incorrectly. This condition is referred to as apraxia. In contrast, right parietal injuries are associated with severe disturbances of emotion, constructional deficiencies, as well as a host of visual-spatial perceptual abnormalities including left sided inattention and neglect. For example, with severe lesions in this area patients may demonstrate a profound inattention to all forms of stimuli falling to their left. 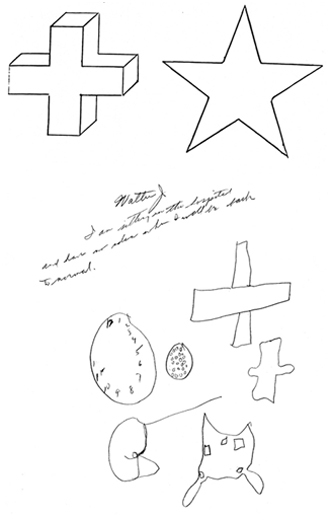 When drawing pictures they may fail to draw the left half of an object, when writing or reading they may ignore the left half of words or the left half of the page, and they may fail to perceive and respond to individuals standing to their left, or even the left half of their own body. Largely this condition is secondary to a destruction of neurons which are sensitive to various forms of visual and somesthetic input. Nevertheless, it is important to emphasize that lesions to the parietal lobe (or anywhere within the brain) are seldom localized to one particular quadrant (e.g. inferior, superior), or even restricted to the parietal lobe. That is, damage may be parietal-occipital, parietal-temporal, frontal-parietal, or even bilateral (such as due to cerebrovascular disease or compression from a unilateral tumor). Therefore, an afflicted individual may display agraphia but normal reading, stereognosis in the absence of apraxia, or conversely a wide mixture of seemingly unrelated symptoms.